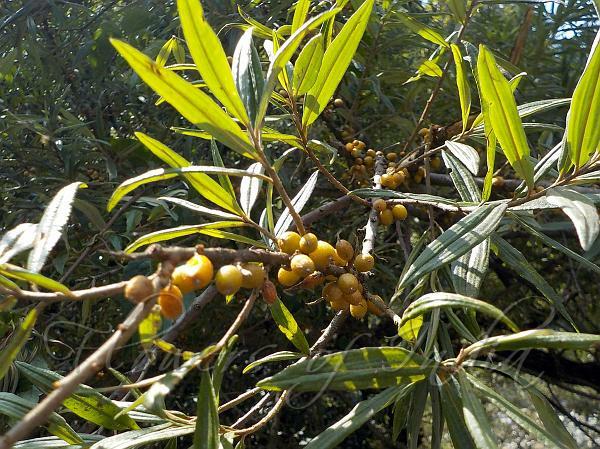 Willow-Leaved Sea Buckthorn is a small deciduous shrub or small tree reaching 2-7 m in height, with a narrow canopy and a well developed root system. Trunk is up to more than 30 cm in diamter. Leaf-stalks are 2-3 mm, leaves whitish below with usually reddish brown midrib, above green, linear-oblong, 4.2-6.2 x 0.6-1.2 cm, velvety below,	hairy above, margin usually curled. Male flowers are 2.5-3 mm, anthers 2-2.5 mm. Female calyx about 2 mm. Peduncle 1-4 mm. Fruit orange-yellow to greenish brown or yellow to deep red, globose, terete, 5-7 × 5-7 mm. Endocarp is easy to separate from seed. Seed broadly ellipsoid to ovoid, flattened, 2.8-5.2 mm. The fruit is edible, rich in vitamins, often made into jam and has medicinal properties. 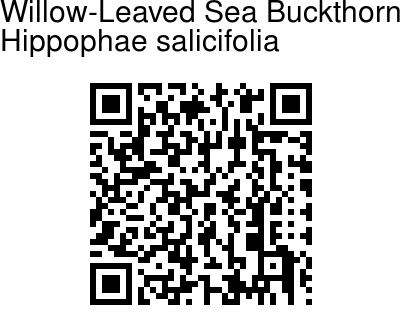 This sea buckthorn can be be found in the Himalayas at elevations of 2000-3700 m. Flowering: June. Medicinal uses: The tender branches and leaves contain bio-active substances which are used to produce an oil that is quite distinct from the oil produced from the fruit. This oil is used as an ointment for treating burns. A high-quality medicinal oil is made from the fruit and used in the treatment of cardiac disorders, it is also said to be particularly effective when applied to the skin to heal burns, eczema and radiation injury, and is taken internally in the treatment of stomach and intestinal diseases. Identification credit: Prashant Awale Photographed in the Great Hinalayan National Park, HImachal Pradesh.